Today I met Jörg Mäder by chance, as he rented out two tipis here nearby for a group of kids and their teacher who stayed a couple of days. 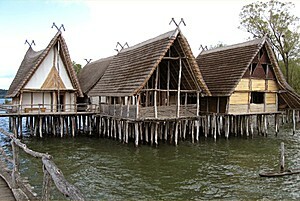 As we talked, he revealed he is attending with his family some of the swiss TV reality show production: living in neolithic / bronze age setup, on pole built houses also known as stilt houses or pile dwellings (so called "pfahlbauer" in german), the coverage is also available on swiss TV SF1, the entire projects is active from 25. July to 23. August 2007) and seems to be a non-sensationalist approach to bronze age life as he told me. 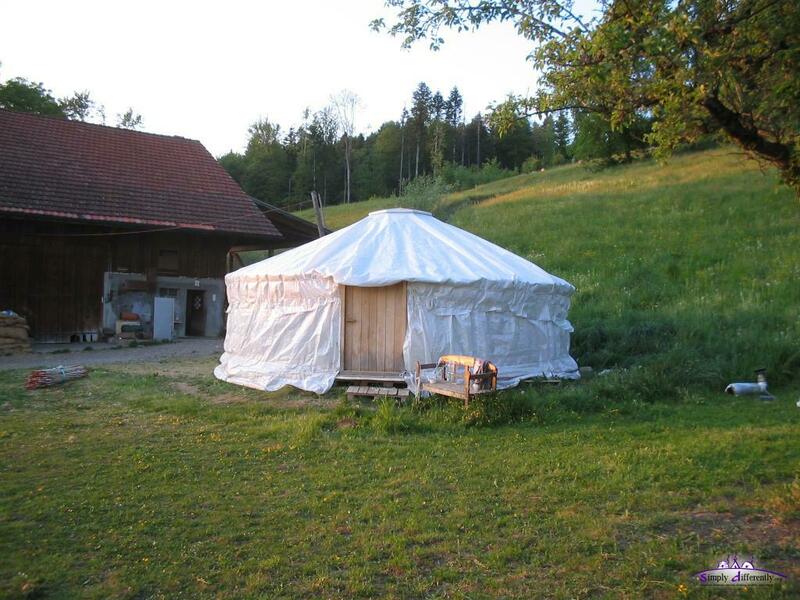 Himself interested in stone age craft and having a small business renting tipis called Waldplausch.ch (can be translated as "forest fun") quite a good match for this project. I try to follow the experiment online as I don't own or watch TV anymore. 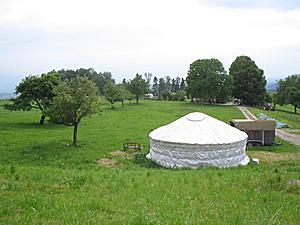 I showed him my yurt briefly and he was surprised how bright it was inside, and hearing that pitching up a yurt skeleton can be done in 40 mins - and another 1-2 hours to cover it for a summer setup. One speciality of his tipis he rents out, he uses bamboo poles, 7m long, the tipi are 6m in diameter, and smoothed the bamboo knots. For long term usage it might require the top and bottom to be sealed with varnish and for the top even cover it with 100% waterpoof seal so no moisture goes into the bamboo. No long-term experience of usage of bamboo poles for a tipi as he rents them just for a couple of days and then takes them down and stores them dry. The last days it has cooled off, from 28°C peak to 12°C now, but with the translucent roof and wall setup (without thermal insulation) even with covered sky it warms up to nice 21°C (with closed door and closed skylight) and 28°C when the sun quickly shines directly on the yurt. After sunset and raining it drops slowly from 20°C to 16°C, and I wear a thicker sweatshirt again while sitting on the computer. I add those notes on the weather for my own, so I can read back the summer 2005, 2006 and 2007 - it's interesting to see summer time doesn't imply hot weather at all, and a stove to heat for the evening might be nice yet for me not really necessary, as the stove is still in the yurt but I disassembled the stove pipe for cleaning. 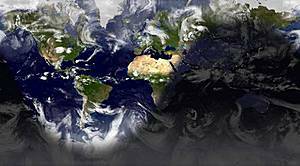 Northern hemisphere celebrates the summer solstice, longest daylight - at some places like Iceland and north pole a day without sunset. Southern hemisphere celebrates the winter solstice, shortest daylight - at some places like Antartica no direct sunlight at all. Somehow related, I received an electronic networking newsletter which also mentioned a solar cooking project, and I thought to consider to bake bread with it as such a cooker reaches 150°C - see SolarCooking.org . Definitely an option for me for spring to fall, in wintertime I doubt to be that useful unless strong sun is available and good insulated cooker. Additionally, I cut the grass near the yurt the first time this year, as snails came into the yurt when it started to rain heavy, as some grass has grown into the yurt beneath the rain cover - so something to pay attention too. After rainy days in late May, and then a couple of weekends being underway with the recumbent, I haven't add much things as of late. 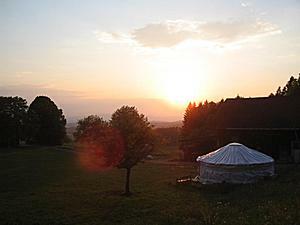 The last 1-2 weeks mild to warm weather, a bit wind which creates a nice draft with open skylight, hardly over 33°C inside the yurt, whereas in the shade outside near 28°C. I also resolved the refrigerator issue by placing the plastic box where all to cold kept things like salad, margarine, soy yoghurt etc into the small well near the yurt, filled it with a 5cm water itself so it swims a bit deeper. 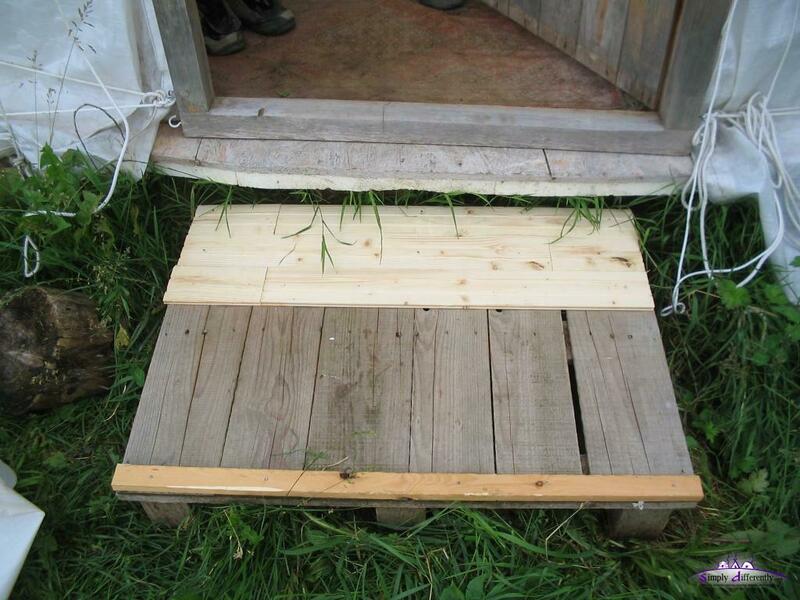 I might have thought of this better by having digged a hole beneath the wooden palettes below of my yurt floor to have a natural earth-based refrigerator (e.g. where you can reach as low as 12°C), but with the well nearby where the water is around 10°C steadily this is also a way. Anyway, next site I go I dig a small hole before I do the floor of the yurt, and have easy access to it. 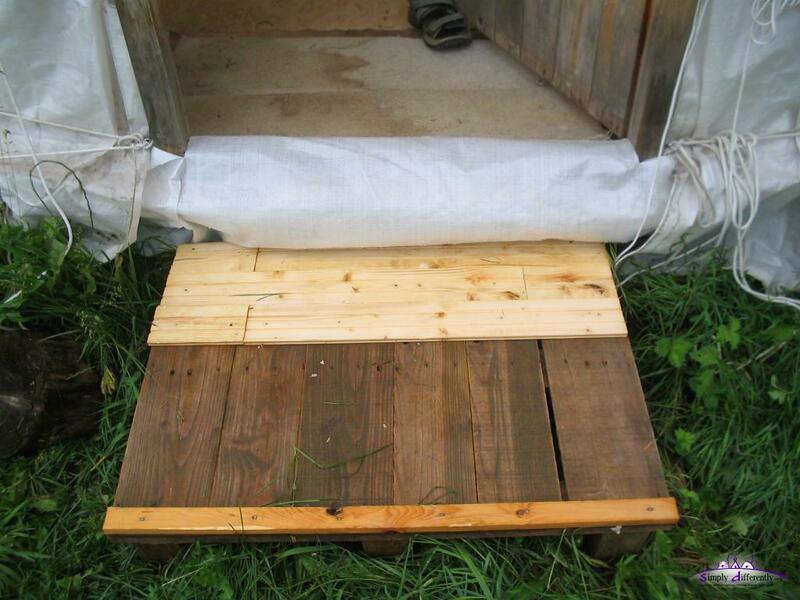 One smaller pallete (so called one-way pallete) I used as single stair to enter the yurt, due the frequent rain and sunshine or wet & dry periods within a day, got weak and one lath broke, and need to strengthen with more and additional laths - it lasted now through entire winter til mid of summer without special preparation. Additionally I covered the low bar of the door frame and the extending floor beneath. This brief video, in particular the sound, gives you an idea of rain on a yurt with PE rain cover and no thermal (and sound therefore) insulation, the PE cover operates like a membrane. With thermal insulation, as I had through the winter time, the sound is absorbed and much more silent inside the yurt during heavy rain. 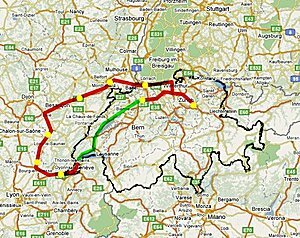 I just returned from a 7 day bicycle ride (with a recumbent) through Switzerland and and a bit of east of France - so the yurt was vacant. Since I decided quick to go for the ride I didn't look for someone taking care or dwell in the yurt while I'm away. 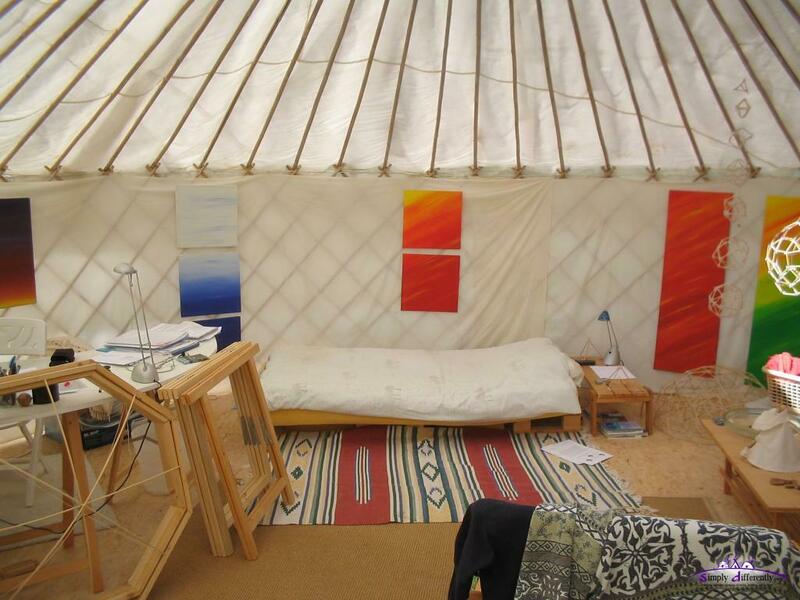 The yurt was closed: fixed skylight and closed door - without thermal insulation the yurt heated up to 45°C as I entered, after opening the skylight and leaving the door open it dropped to 38°C still with direct sunlight, outside temperature aprx. 28°C. I made sure nothing easy flameable remained (gasoline for cooker or matches) - since I didn't know how hot it could get while I'm away. 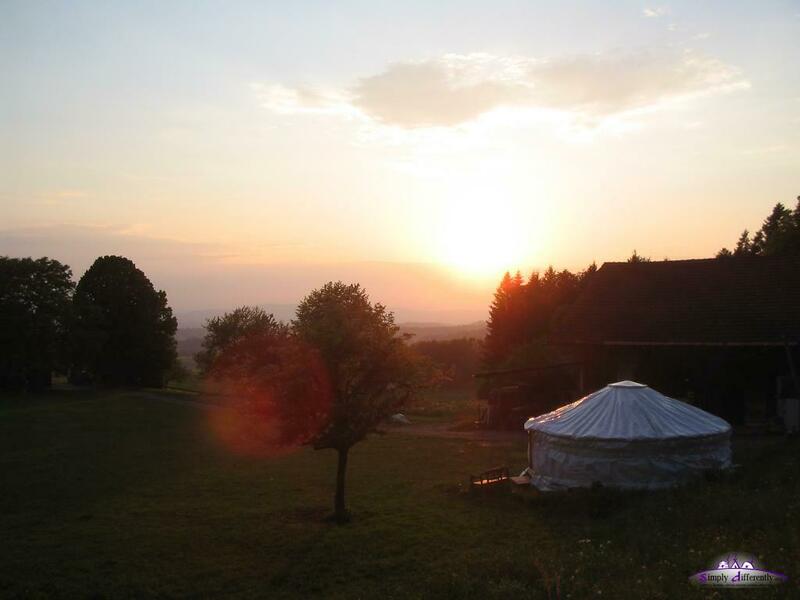 It's 20:00 and still 33°C inside, and 28°C outside the yurt - summer has arrived (again). I'm gonna take a shower with the douche bag I have - this time cold water prefered. Later I tried my first pan pizza, by simply preparing the pizza (yeast based dough) in a frying pan before putting on the stove, and then flipping it to bake it on both sides - and it worked to my surprise. My oven doesn't provide baking - and right now I have only electric stove with two plates, and one thing I miss living in the yurt: baking. Baking flat bread in the pan or even on top of the wood stove worked too, but pizza is the first time I tried. This morning, 5°C in the yurt, outside maybe alike - yesterday afternoon having 27°C in the yurt with brief direct sunshine. Around 10:00 I get direct sunshine, and it will heat up to 25°C within 30 mins. It would be nice to have a thermal buffer which balances the extremes a bit, which thermal insulation does, but I like to maintain the translucent roof and walls, so looking for transparent thermal insulation, multiple layers of bubblewrap I used before might do it, yet, it isn't UV stable, and gets porous after a summer season such as exposed on the roof. One and a half days rain with short interruptions - covered sky. During the rain the temperature didn't rise over 15°C and fell to 12°C at the evening quickly. The PE cover on the roof sealed 100% - no leaks, but some of the wall PE leaks and a bit water entered the yurt on one side, which was easy to fix. The wall rain cover is porous where I usually bend it over the floor, in general whenever PE is folded it tends to porous and leak then later. The moment the sun comes through just a bit, even still raining, the temperature rises above 20°C within 30mins. Also some stronger winds up to 80-100km/h have been coming, and the removal of the straw insulation makes the yurt now very light and lacking inertia. Since I removed the winter insulation the temperature drops are fast after sunset, and midnight unusual low 15°C already - something to get used to again. April 2007 has been 5°C above average temperature since 1870's - and almost no rain except a few drops, it will be interesting how the summer will become. Tonight we seem to get the first rain after weeks but just 1 hours long - good for the land and farmers. Like before, I used the old PE rain cover below the newer one I've got in fall 2006 - let's see if both seal the rain 100%, the PE gets brittle after a year and small holes leak rain. Anyway, I still use PE as rain cover because it's rather cheap and very light (150g/m2), and therefore easy to handle by one person. Just a few days in the dome, and today I have taken down the dome again - the first test pitch-up with all layers for a summer setup revealed that the connectors I have chosen were too weak once heated by the sun, and became too soft. So, I pitched up the yurt again, the same setup like last summer, just PE as rain cover and the interior cotton layer. I also took the chance to fix the cotton a bit where it has torn - and now it's all set. I gonna miss the dome, it provided a larger or grander space, of course due the spherical shape it's numerically provides more volume, and it makes quite a difference, whether ~2.75m (yurt) or 3.20m height (dome), just 50cm higher but an immense difference as the roof is spherical and not cone-like as the yurt. Anyway, I'm back in the yurt.